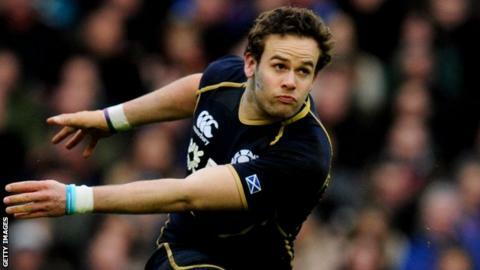 Wasps and Scotland fly-half Ruaridh Jackson has been ruled out for between six and nine months with an anterior cruciate ligament tear. The 26-year-old will need knee surgery after limping off during Sunday's victory over Northampton Saints. He will miss Scotland's autumn internationals and Six Nations campaign and is likely to be out for the rest of his debut season with Wasps. "We are all incredibly disappointed for Ruaridh," said Wasps boss Dai Young. "He has impressed me during training, both with his skill level and his attitude, and it's a real blow to lose him after he played so well in pre-season and when he came on against Northampton Saints last Sunday." Jackson has 25 international caps but has not started for Scotland since 2013, with Duncan Weir occupying the number 10 shirt. He moved from Glasgow Warriors to Wasps this summer to compete with Andy Goode for the fly-half position, but after coming off the bench against Saints and converting two tries, had to be replaced by Rob Miller. Miller is a recognised full-back, but can act as cover at 10 behind Goode and Alex Lozowski.